I love to listen to music while I work, and I am all for it helping me focus. I love biohacking and productivity hacks and this tool is both! 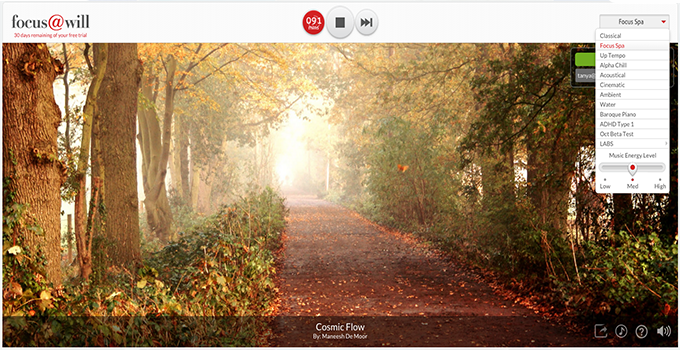 Focus@will is music Scientifically Optimized to Boost Concentration and Focus. You can customize intensity of timed sessions to match your cognitive type and mood. With music channels like Focus Spa, Alpha Chill and even ADHD Type 1(which is a little scary to listen to), this could be your new secret weapon to being uber productive! You can actually track your productivity by using the Productivity Tracker to record your productivity and customize your sound sessions. Find out what types of music and energy level settings keep you most focused and productive so you can personalize for your cognitive type and biorhythms. Mainstream music lowers comprehension and creates distraction because it is designed to connect with you intellectually and emotionally. Focus@Will technology delivers various “Attention Amplifying” music channels scientifically designed to engage with your brain’s limbic system. This soothes the easily distracted fight or flight mechanism increasing attention span and general focus. Actually based on neuroscience. Trials show typical 12-15% positive increase in focus bio-marker and up to 400% extended session time. Download our White Paper here. You can get your free 30 day trial here, nothing to lose, try it! What Does a Fresh Start Sound Like? In anticipation of the new year, I received an email from Shutterstock, a stock photography, music and video company. I love the theme of the email. Whether for business or pleasure, the New Year means a new opportunity to make your mark. Check out our collections below for inspiration on current projects and future adventures alike. They have compiled a list of songs that embody a fresh start: A motivational mix of upbeat instrumentals and catchy vocals for bright days and new beginnings. Shutterstock does a really nice job of curating their their Sound Boxes into themes and feelings which helps users easily find what they are looking for. Their pricing is really great as well for those of you who are looking for music for your next video, presentation or event. But why does music matter? By adding carefully chosen music to your projects you can stimulate the emotions of the listener and connect with them on a level that no other sense can do. Of course this assumes that you know what feelings you want to convey with your music. If you are a business, you should have a list of key feelings that you want your prospects and users to feel when they think about you; happiness, security, trust… So how would you go about choosing music that evokes these types of “feel good” emotions of your audience? One way is to connect with them through nostalgia. 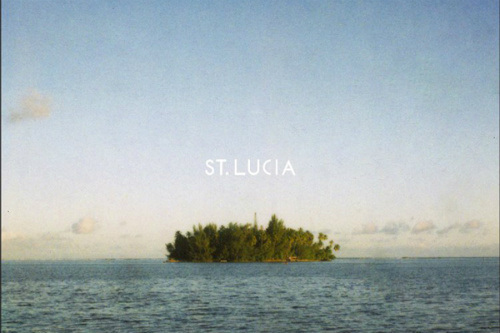 An example of a band that gives me the warm and fuzzies because of my nostalgia for the 80’s is St. Lucia. Their integration of synthesizers and 80’s sound really resonates with this 30-something. You can hear this influence in my current favorite song of theirs All Eyes On You.